Air Force Captain Joseph Kittinger, Jr. jumps from Excelsior III balloon gondola in 1960 test, freefalling toward Earth for over 4 minutes. Getting back to the present, the space diving suit currentlyunder development by Orbital Outfitters is both an extreme sporting device andan emergency backup for returning from space. One of the developers of the space diving suit, JonathanClark, is a former NASA flight surgeon with a somber reason for working on thesuit. His wife, astronaut Laurel Clark, was killed in when the space shuttle Columbia burned up in reentry. Clark and his partner Rick Tumlinson, who founded the SpaceFrontier Foundation, hope to demonstrate a 120,000 foot jump by 2009. 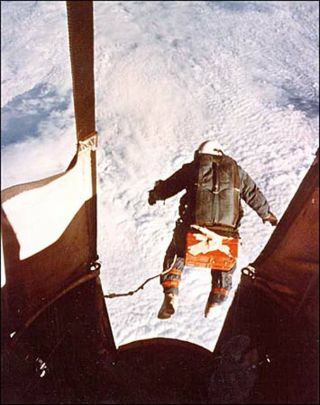 Thecurrent record for a skydive, set in 1960, is 102,800 feet (see photo). The first space dive, from a height of sixty miles,would be attempted two years later (see an artist's rendering of the spacediving suit).